I recently got to spend 4 days on a shoot with Gab707. 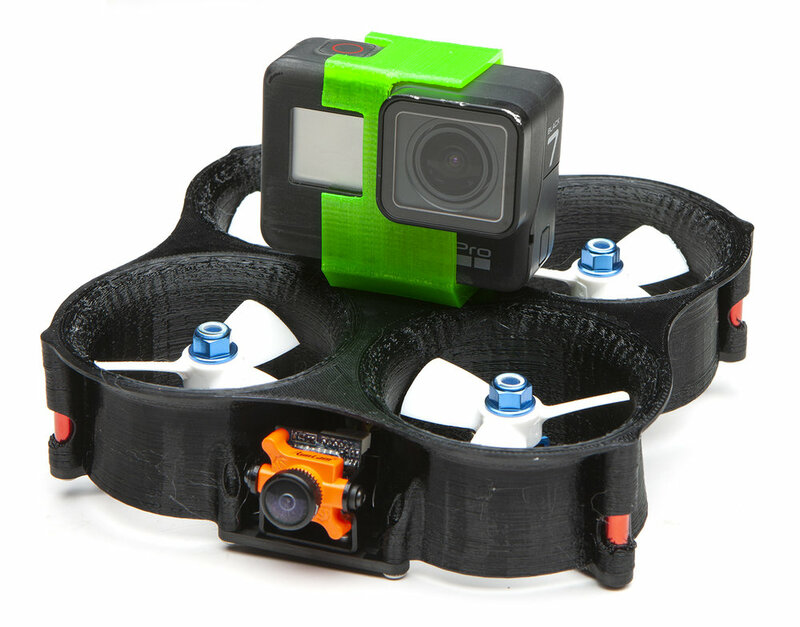 Gab’s one of my favorite people in fpv since he’s a world class pilot, and he’s super smart and has innovative ideas. But most importantly, he shares his frame ideas with me, like Ichabod and Ichabod Jr. We brainstormed during the shoot and came up with a ton of ideas, and this is one of them. 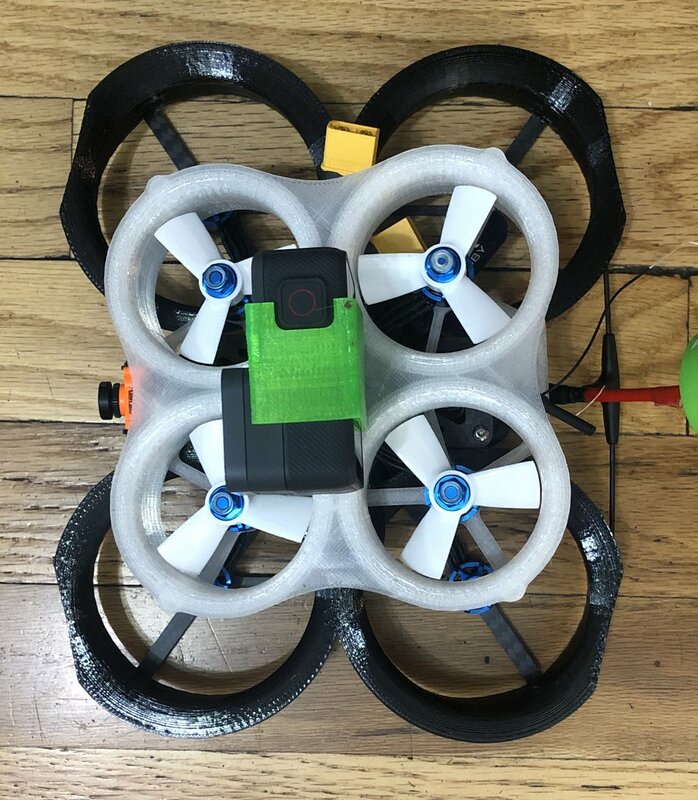 Gab showed me a little 2” brushed whoop that he uses to carry a full, NOT decased (double negative alert) Hero7. It can barely lift it on 3s, so it’s specifically for those times when he has to hit gaps too small for Squirt. So Gab’s challenge was, can I make something much smaller than the Squirt that can carry a Hero7 comfortably? 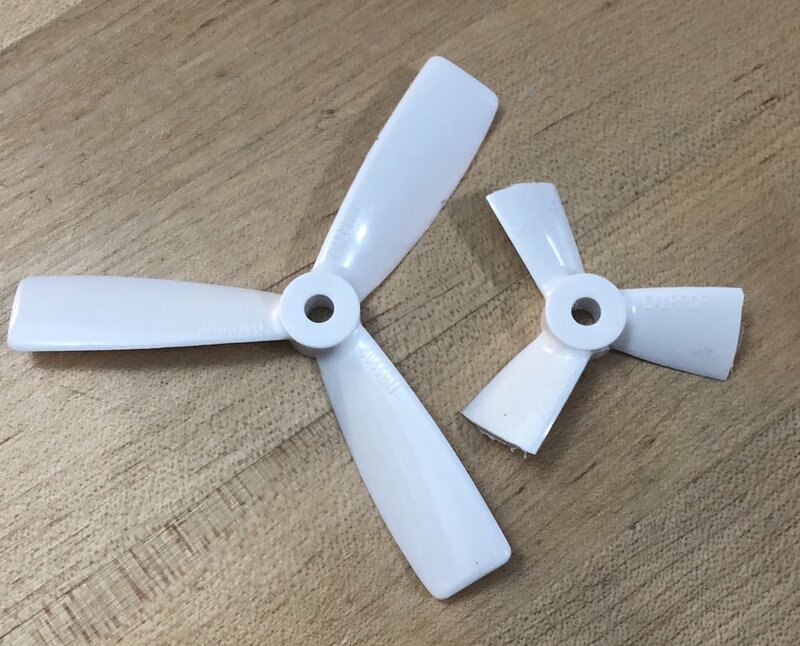 My big idea was to use a Squirt-sized power train and just chop off a half inch of prop, instead of using a tiny motor and standard 2” props. Then I could duct it and use a big fat chopped down 4 or 5” prop, and hopefully that’ll produce way more thrust than a standard 2” power train. I also wanted to see if I could use normal fpv components instead of the integrated cam/vtx on most whoops. With a similar form factor as Gab’s tiny frame (Hero centered on top, battery centered on the bottom), I settled on 53mm for the prop diameter, a compromise between size, fov clearance, and hoped-for thrust (since I’m cutting my own props there’s no reason to adhere to standard sizing). With my carbon cutter on Chinese New Year break, I went ahead and drew up something to be printed in nylon. Who knows, maybe it’ll be stiff enough to be a fully printed frame. Like Squirt, the ducts are braced at three points, with 20mm standoffs inserted. I extended a flat top across the ducts for two reasons. One, it ties them all together, and two, air accelerates along the flat top as it rushes into the ducts, creating a low pressure area, or more lift. The baseplate was 2mm thick. I stripped a Pteromini for fc/esc stack, grabbed some Rotorgeeks 1407 3200kv’s, and built it up quick to test LOS. It’s smaller. That is all. Note how there isn’t an ‘arm’ from the center to the motors.That’s to make room for the battery strap. It’s unusual, but proved to be ok.And yes, I was having first layer issues with my printer. LOS test flights were promising. It lifted a Hero at about 55% throttle with a banshee like sound, but it did it nevertheless. AUW was 356g with a 650 4s. It was time to put fpv stuff on it, but there were some problems. See how the center section is completely enclosed? That means I’d have to route wires through holes to other components, a major PITA. The design created a sealed compartment for the FC, which meant I’d have to thread wires through the top piece to get to the camera. The camera would be mounted to the top piece as well, so you couldn’t open it up without having to deal with a tangle of wires. And if I wanted to put the rx in the back, away from the vtx, the same problem would apply. Clearly this thing would work better if all the components could be mounted to the bottom plate, without having to thread wires through holes in the top piece. The blades have a lot more pitch close to the root (that’s the whole point), and that put a lot of the tip next to the curved lip of the duct, instead of hugging the wall. So I started over from scratch. I added a 5mm straight run to the duct profile just for the prop tip to hug. This made the whole thing taller, which was a good thing since I’m using an HGLRC XJB triple stack. I moved the bracing points for the ducts so there’d be a gap for wiring to the front and back. And I added mounting points for a micro cam bracket so that the cam could mount to the bottom plate. The whole thing was the exact same size, but now it’s easier to build and maintain. Starting to look more and more like a jet turbine with the big heavily pitched props. That’s a 5 degree Hero mount. This thing really should have an XT30 but I’m too lazy to swap out the connectors on my batteries. I fired it up and the motors pulsed like crazy and got super hot. I widened the cross braces and it did the same. Then I realized that two of the braces had become too vertical and co-linear, which allowed the motors to vibrate laterally. I begrudgingly added one more brace (braces block thrust), and it finally flew normally. I did my usual laps around my apartment, and it flew pretty well. One thing that was different was an odd tendency to self level on pitch, as if it was in angle mode. I kept dialing up pitch p and i but the tendency persisted. Still, it wasn’t something I couldn’t adapt to, so I just pushed the nose down more to keep it moving forward. So I’m pretty excited, this thing seems to work. I charged some batteries to try it outdoors, only to discover that the flutters came back. What happened? Did the nylon baseplate weaken so quickly? I have no idea, but it just confirmed to me that it really needed a carbon baseplate. Meanwhile, I was chatting with Chad Miller and he mentioned that he’s been playing around with Matterhacker’s carbon infused nylon, NylonX. I’ve used it before, but got tired of dealing with worn out nozzles. Chad offered to print a baseplate so I could keep experimenting while waiting for carbon plates from China. The print proved to be strong enough, so I got out to fly it in a more open space. It still had that odd tendency to level off, but as you can see it just takes a little forward pressure on pitch to keep it smooth. The accidental move at the end is the Mattyest I’ve ever been. I haven’t flown any 2” brushed whoops, but I’m going to assume that this thing lifts a Hero better. Carbon baseplates are being cut now, but in the meantime if you want to play along stl’s are here, including the smaller prop cutter. The baseplate has been redesigned to have 3 braces again, but now evenly spaced at 120 degrees. You’ll want to print that with something stiff like NylonX. I print the top upside down with Taulman 645, and the Hero mount is TPU. I have an extra Craftbot that I got to deal with the Squirt V1 rush sitting idle, and I found a steel nozzle and some NylonX lying around, so I fired it up to print more baseplates. Then Justin Oakes of Droneworks stopped by to pick up a Squirt, and he saw Nutmeg and really wanted one. I had parts lying around, so I woke up one day and decided I was going to build another Nutmeg. And the crazy thing is, this one flew better. It held pitch totally normally. Why? I have no idea, but I was just glad to find that the design didn’t have any inherent bad flight characteristics. Also, I remembered to take some build pics this time. 45 degree board orientation makes for funny wiring. Leave enough slack in the wires for the ducts. Everything’s attached to the baseplate, so the top can just drop in. It’s relatively painless except for the high number of screws (10!). I hadn’t flown one battery all the way down without pausing or crashing, so I took it around the apartment and was pleasantly surprised that a 650 4s flew for 3 whole minutes. It’s also a good way to check in on the 3d printers. Then Evan Turner asked if it could take a bigger battery, which seems insane to me, but ok, why not give it a shot. I put a 1050 on it and it looked silly, with the battery blocking a lot of the ducts. So it’s heavier, with thrust blocked. Shouldn’t fly, right. Oddly enough it felt the same, and flew for 4:30. Just when I think I understand anything about quads, I’m proven wrong. And here’s some unstabilized footage so you can get a better sense of how it flies. Whitenoise 20x20 VTX mounting board. His hovers at about 45%. Guess I gotta build myself another one now. 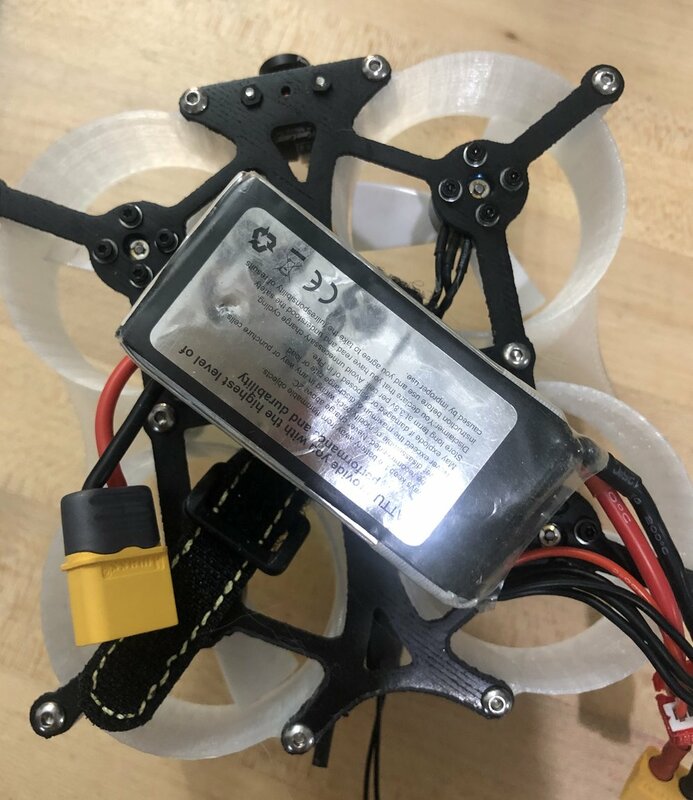 Clint has a nice Rotorbuilds writeup here, lots of good info. So, if you ever design anything don’t do it around Chinese New Year. It took forever for the carbon to show up. 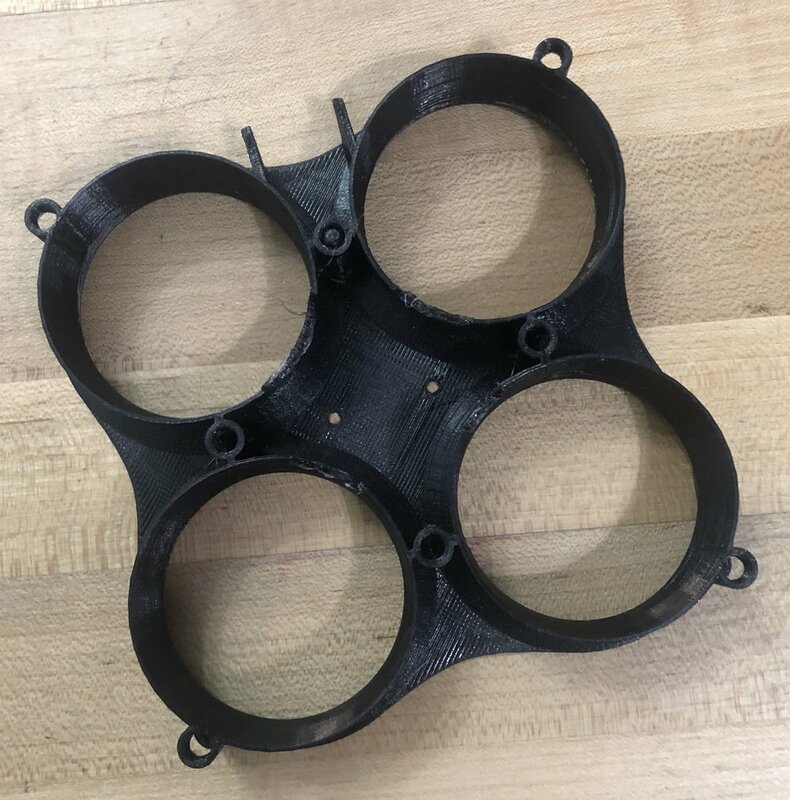 I tweaked the duct file for TPU and printed it up in black, and moved the parts over. All printers were busy so I didn’t print a black Hero mount. Since it’s a camera rig all production parts will be black to avoid reflections. Not surprisingly it flew just fine like this, and here’s yet another tour of my apartment as proof. You can buy it here. 3d parts files are here. You can always print all of it if you don’t want to buy a carbon base plate, but it’s so much nicer with real carbon, and the stiffness of the carbon allows the use of a TPU top, which is way more durable.